Whether Hurricane Flossie weakens to a tropical storm and stays safely south of the Hawaiian Islands, or keeps its strength and heads toward us won't become clear until sometime today or tomorrow, says the National Weather Service. The Category 4 storm was less than 1,000 miles from Hawaii and entered the Central Pacific Hurricane zone yesterday morning, moving at about 12 mph. Civil Defense officials urged residents to make sure they plan for a hurricane, including knowing where to take shelter and storing water and other supplies, just in case. 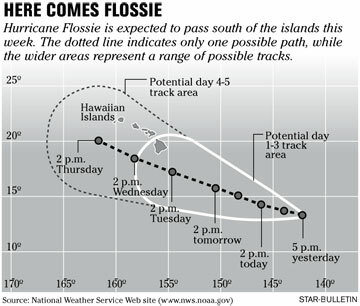 Packing sustained winds of 138 mph and gusts up to 167 mph, Hurricane Flossie moved steadily toward Hawaii yesterday. State and county civil defense officials, who are watching the Category 4 hurricane around the clock, urged residents to have hurricane supplies and plans ready, should the storm retain its strength and veer north toward the islands. "Although the current forecast keeps the center of Flossie south of the Hawaiian islands ... a closer approach cannot be ruled out," the Central Pacific Hurricane Center said in a statement. An Air Force Reserve WC-130 hurricane hunter plane will be flying through the storm this afternoon, gathering information to help forecasters. "They get pressures, wind speeds and temperatures, to help us get accurate idea of where the center of the storm is, what its intensity is and the wind field around its center," National Weather Service forecaster Kevin Kodama said. "Because of the way the weather pattern is evolving, the next couple of days is going to be key," Kodama said. The Weather Service's five-day forecast yesterday evening showed the central line of Hurricane Flossie's potential track passing about 85 miles south of the islands. Yesterday Flossie's hurricane-force winds extended 40 miles from its center and tropical storm force winds extended 90 miles. Cooler waters and wind shear are expected to weaken Flossie to a tropical storm. But, "anything more than 48 hours ahead, the uncertainty is still pretty high," Weather Service forecaster Norman Hui said. The state will likely see some of the effects of Flossie late tomorrow with what the weather service called a "ramp up" of surf on the Big Island's south shore , with 8- to 12-foot waves peaking Tuesday. But Big Island residents didn't seem to be in hurricane mode yet yesterday, according to managers at several hardware and grocery stores there. "I haven't noticed anything unusual like people buying batteries and toilet paper," said Cynthia Tagavilla, a supervisor at the Captain Cook Ace Hardware. Hurricane Flossie's approach was also not on the minds of most Iwilei Costco customers yesterday. Roxanne Fo, 48, said she was not worried about the storm but filled her shopping cart with toilet paper, water bottles and canned food. "I'm always prepared for a storm, I have a big family," Fo said, adding that even if the storm does not hit Hawaii, she would still make use of her purchases. That's precisely the plan-ahead attitude that civil defense agencies want people to have. "We're just advising folks, if they haven't done so already for hurricane season, to check your emergency supplies -- batteries, food and water, and supplies to take care of themselves a couple of days if they have to," said Dave Curtis, a state Civil Defense spokesman. "And if you don't have a family plan you ought to have one -- how to get in touch in case you get separated from each other," Curtis said. "Before (Hurricane) Iniki (in 1992), there were long lines of people trying to get into stores. It's too late if you wait until it's already on top of you." » A family disaster plan: Discuss in advance how you will contact each other if separated and how you will get back together. Also make sure you have a plan for your pet. » A disaster supplies kit with enough food and water for 3 to 7 days, medicines, toiletries, clothes and blankets in case you have to evacuate your home. » Keep a battery operated radio, flashlight and spare batteries on hand at all times. » For those in frequently flooded areas, keep materials such as sandbags, plywood, plastic sheeting, and lumber to protect property. » Know the location of your nearest hurricane shelter. Shelter locations are available by calling state or county civil defense agencies or by going online to www.scd.state.hi.us. 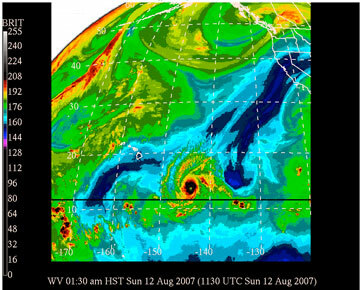 For the latest information on the storm, visit the National Weather Service's Central Pacific Hurricane Center at www.prh.noaa.gov/cphc. The site also has links to the state and each county's civil defense agencies. 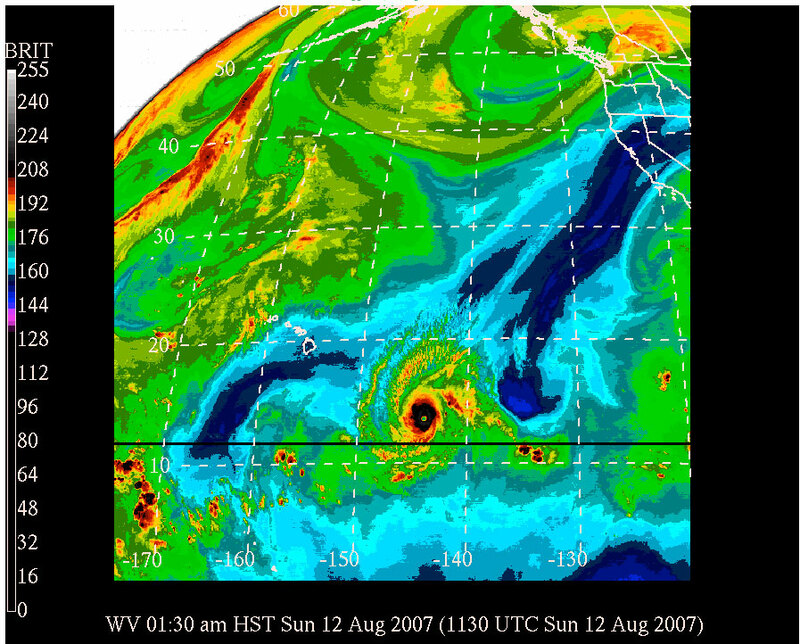 See also weather.hawaii.edu for dynamically generated satellite imagery of the storm. Reporter Brandi Salas and the Associated Press contributed to this report.